The Shake and Indulge Like the French seminar at Walt Disney World’s Epcot Food and Wine Festival is so poorly named. It’s really just a Grand Marnier tasting seminar that is so awesome I’ve been twice, and would like to attend many more. 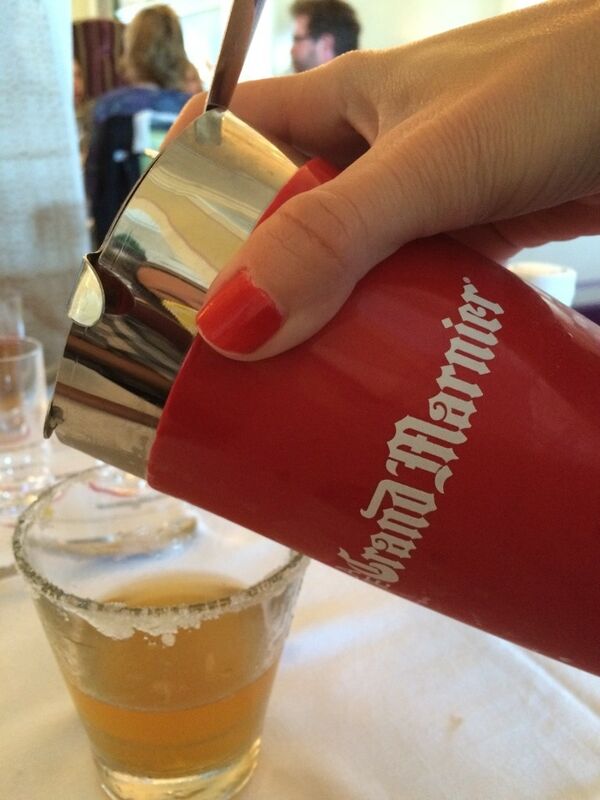 We’ll just call it the Grand Marnier seminar from here on out, because that’s truly what it is…. You’ll enjoy this seminar – one of the additional add-ons of the Epcot Food and Wine Festival and held only on Saturdays – in the Monsieur Paul restaurant in the second level of the French restaurants building in the France pavilion. Upon entering, we were shown to our assigned seats where a table LADEN with Grand Marnier was awaiting us. 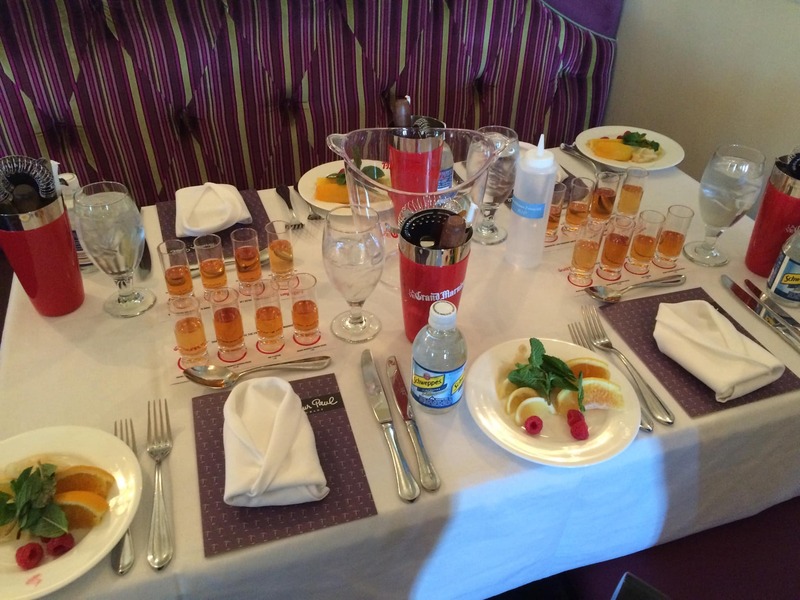 The shot glasses contain 1 – 1.5 ounces of Grand Marnier each, depending on what recipe they’ll be used for. I’ve been to this seminar twice. 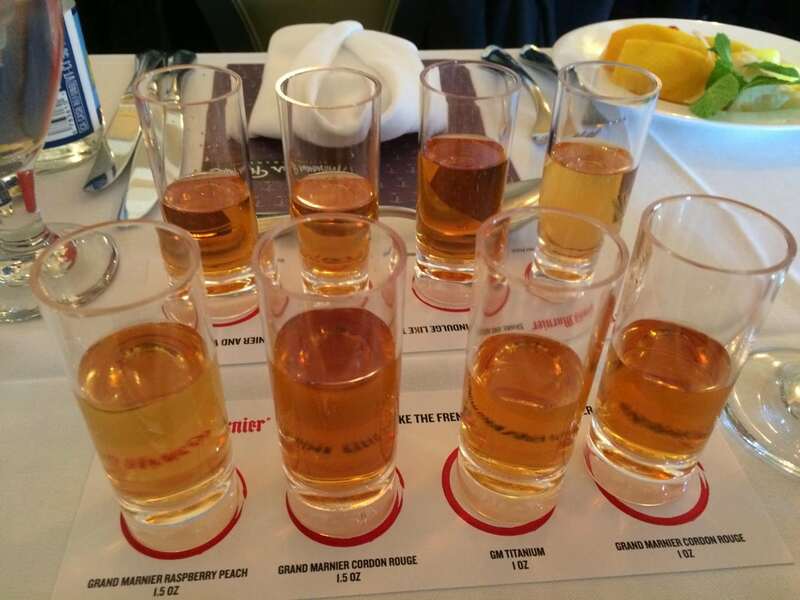 Each Grand Marnier seminar is a little different, but generally starts out with a welcome cocktail featuring Grand Marnier, along with four shot glasses of different types of Grand Marnier to create cocktails with. You’ll have a plate of cocktail accompaniments, along with bar tools, glasses, water and everything else you could possibly need to enjoy your Grand Marnier tasting. 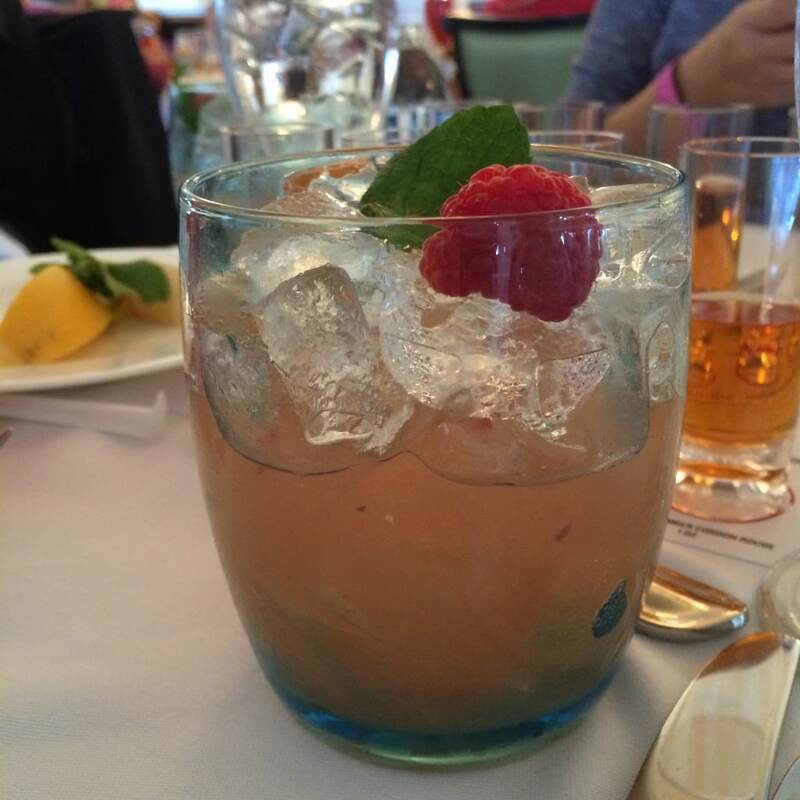 The opening cocktail for the 2014 seminar was a Grand Kappa Sour, made with Kappa Pisco, Grand Marnier Cordon Rouge, lemon and bitters. The welcome cocktail was pre-mixed and sitting on the table when we sat down. I highly suggest that you start enjoying the welcome cocktail as soon as possible. There is no need to wait until the program gets officially started. It’s a lot of alcohol in an hour and a half, and you need to pace yourself, and that means starting early. When everyone was seated, the seminar officially started with an emcee walking through the restaurant with a microphone explaining the history of Grand Marnier, what we would be eating, the ingredients, and how to mix cocktails. First up was a Parisian Smash cocktail that we all had fun mixing and shaking in our Grand Marnier branded cocktail shakers. 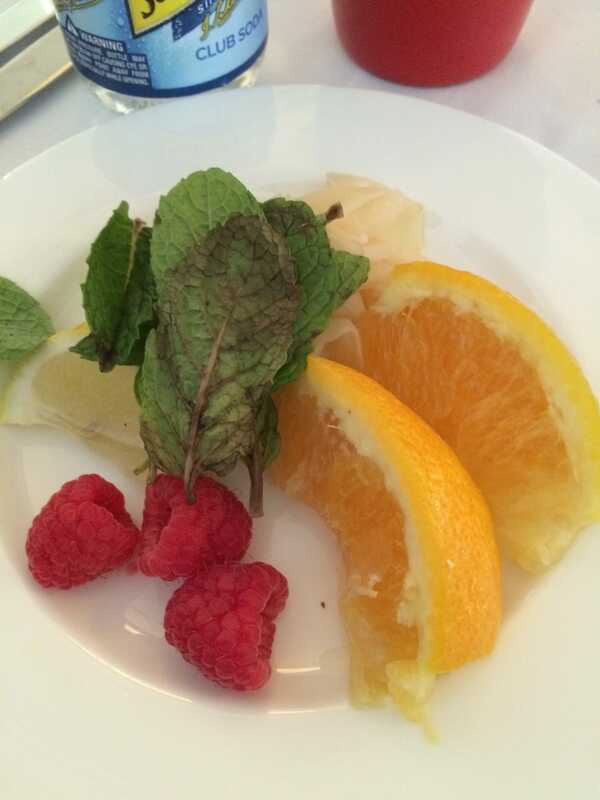 We muddled orange, lemon, raspberry and mint together before shaking with ice in a cocktail shaker. The sound of so many people shaking ice all at the same time is deafening, and yet so much fun to be a part of as a group of mixologists. 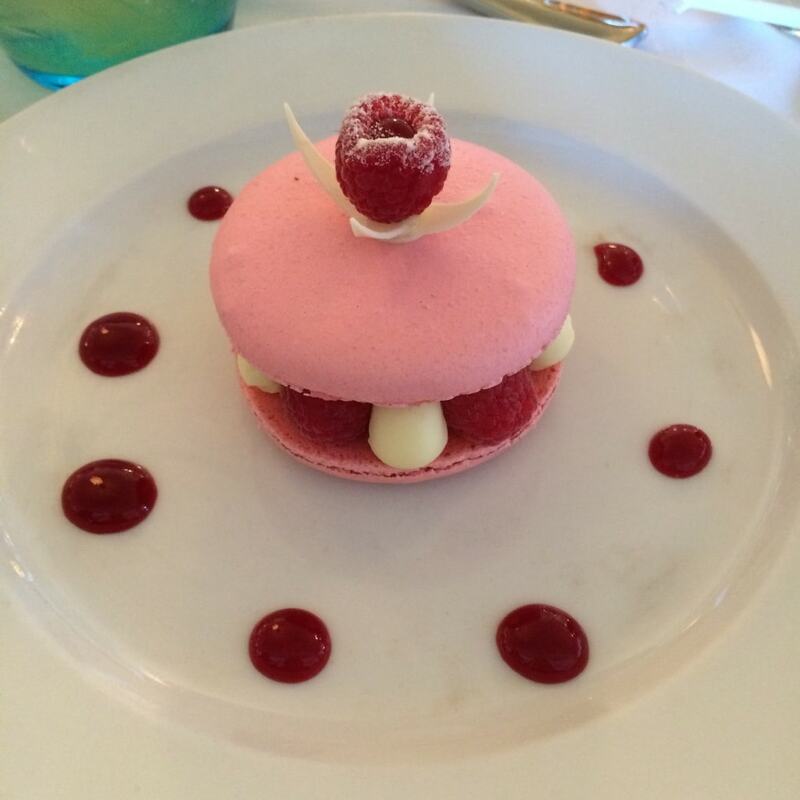 The Parisian Smash used Grand Marnier Raspberry Peach and was partnered with a Macaron Opalys framboise dessert made with an almond macaroon, white chocolate cream, raspberries and homemade raspberry jam. 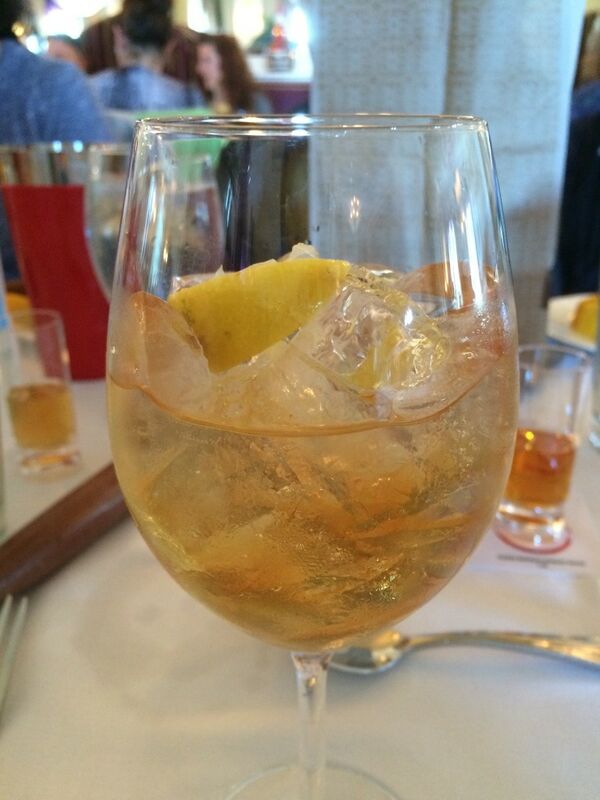 Next up was the Orange Spritz, a drink that was stirred, not shaken. We mixed Grand Marnier Cordon Rouge with club soda and lemon in a wine glass for a refreshing drink that did taste like orange, without any orange added. 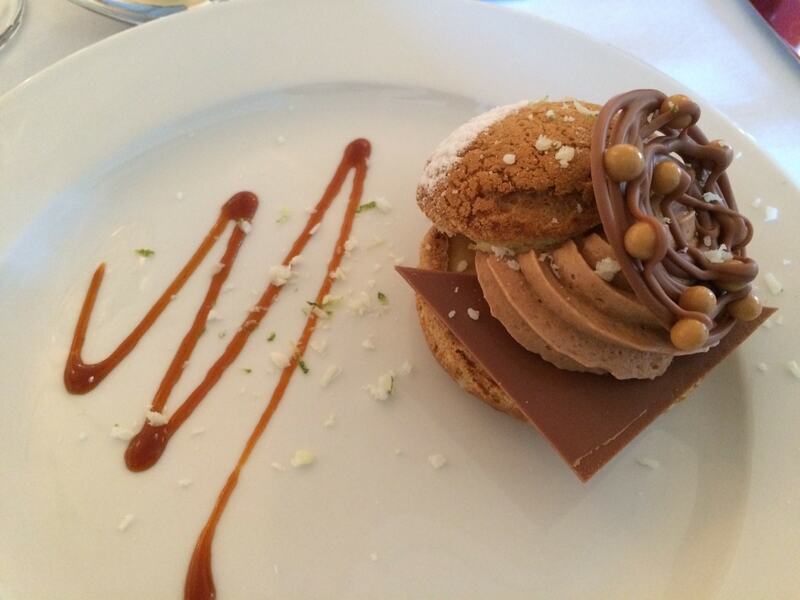 The Orange Spritz was paired with a Choux Dulcey Bahibe dessert with a caramel Fleur de Sel cream, Bahibe light cream and chocolate pearls. 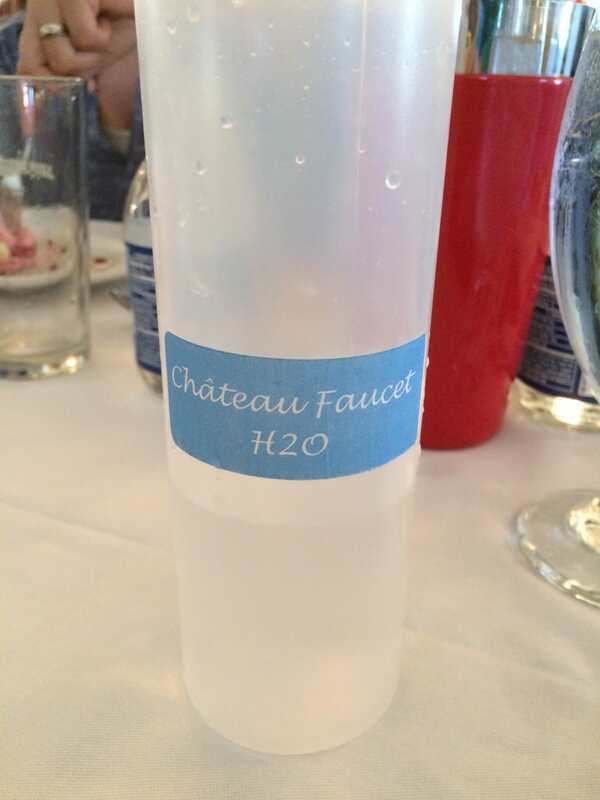 We used our cocktail shakers again for the final cocktail, but rinsed out the shakers beforehand with a bottle of Chateau Faucet H20 to get rid of the previous cocktail’s remains! The final cocktail was the Ginger Spice Side Car. 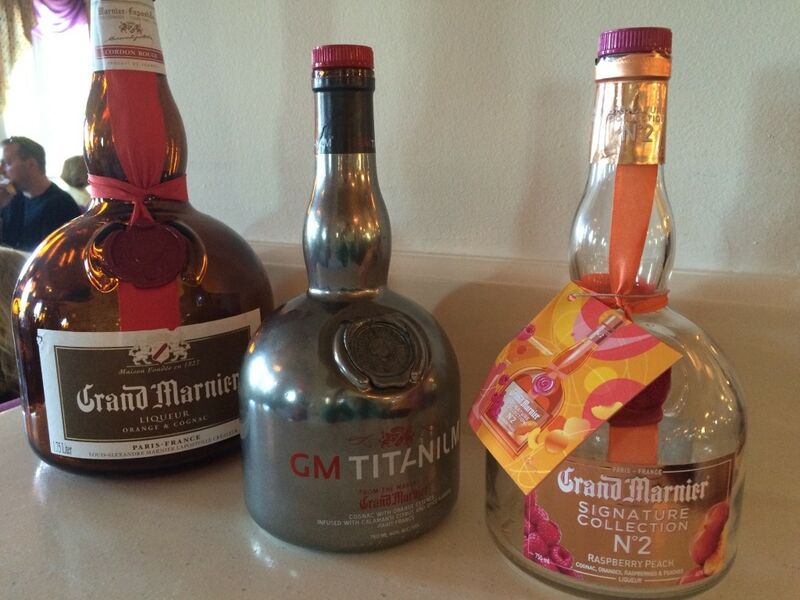 This one used two different types of Grand Marnier – the GM Titanium and the Grand Marnier Cordon Rouge. We added lemon and ginger (you could choose the amount that you wanted, based on your tolerance of ginger) and poured into a glass heavily rimmed with sugar. The dessert pairing was a Finger Satilia Tainori, with a flourless chocolate cake, praline and Tainori chocolate crunch, chocolate mousse and chocolate meringues. Along with Grand Marnier sponsoring the seminar was Valrhona, a French luxury chocolate manufacturer. Their chocolates were used in the desserts. 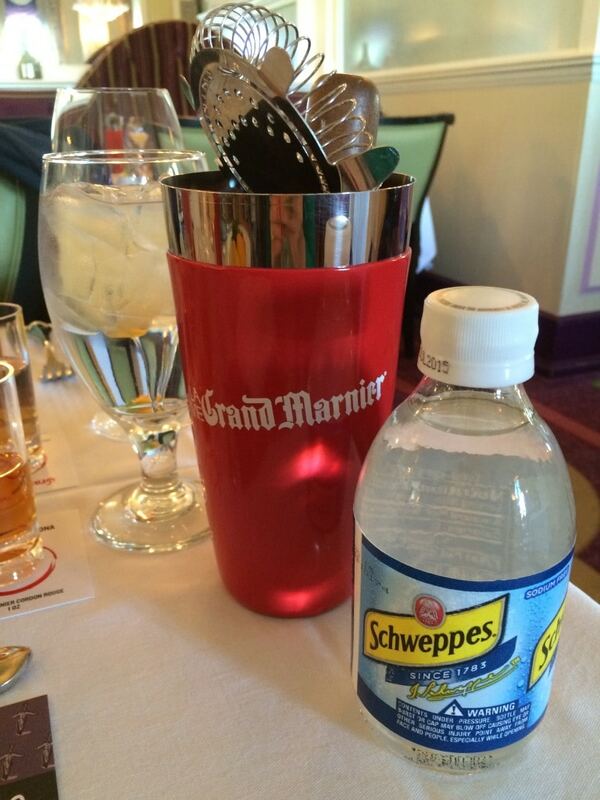 Afterwards, Grand Marnier gift bags were given to all guests. Inside were a Grand Marnier branded cocktail sipper, a Grand Marnier keychain, and a Valrhona chocolate bar. There’s not much to say about the Grand Marnier Shake and Indulge Like the French seminar that can’t already be inferred from the pictures. 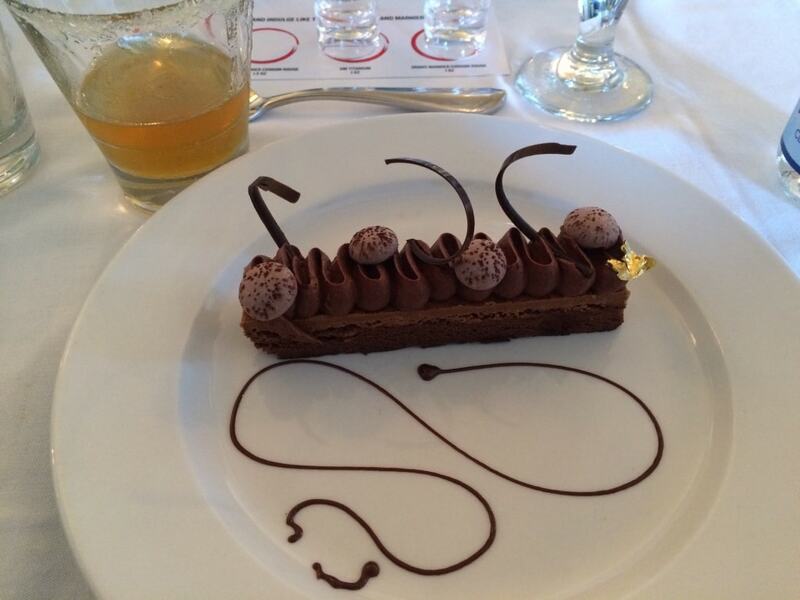 This is a decadent seminar and a tasty one. If you love pastries and enjoy Grand Marnier (or simply want to try it for the first time in grand fashion), this is a must-do event at the Walt Disney World Epcot Food and Wine Festival.